Google’s local efforts have grown tremendously under the direction of Marissa Mayer, and now encompass a wide range of products, including Google Maps; Google Places; Zagat; Google Offers; and Get Online, a new SMB initiative. 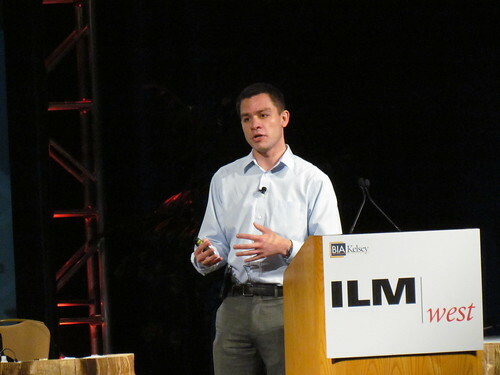 At ILM West this week in San Francisco, Head of Local Consumer Marketing Jeff Aguero provided a rich portrait of Google’s thinking on local. “We are 10 percent of where we are and where we need to be,” said Aguero. “There is so much that needs to be done.” He added that Google is eager to work “closely with partners to create a rich opportunity” for all. Within Places, Place Pages is a major effort. Currently, there are 50 million dynamically generated Place Pages worldwide. Of these, 8 million have been claimed by the businesses themselves. “It is the greatest catalog of place data on the Web,” noted Aguero. Expanding ratings and reviews is also clearly a major initiative. Google Places is now getting more than a million ratings per month. Mobile, meanwhile, is in the middle of it all. “Fifty percent of maps usage is mobile,” Aguero pointed out. “Mobile search usage has surpasses desktop usage on holidays. “People are using mobile phones as guides to the real world on an ongoing basis. Recently, the company introduced TalkBin, which leverages mobile to provide real-time customer feedback. Google Latitudes, a check-in product, is also is getting a lot of attention, and already has 10 million users. “It is not just how many people are enjoying and sharing products,” said Aguero, noting that Latitudes has been greatly enhanced by the introduction of Google Plus social circles. And then there is Google’s Get Online initiative, a partnership with Intuit that lets SMBs claim a place, update information and provides a free website. Get Online started in Michigan and is now in 14 states. New tools will continue to be added, said Aguero. “We need better toolkits for businesses.” Recently, the company introduced Adwords Express, which lets businesses set up an AdWords program in 10 minutes. The problem here is that Google keeps offering semi-cooked products. I believe they’d have much better results and much faster adoption rate if the products were of better quality. The core product on which they currently step – Google Places, is so beta-ish that it is already notorious about that. And AdWords Express is, for me, a direct, straight-forward Google saying “that’s how we make easy money from the non-tech savvy business owners”. ………..”We need better tool kits for businesses.” For the local merchant/vendor a better tool kit is not one that is so heavy it cannot be used effectively or affectively. Not to argue semantics with SMB’s as to its definition but to put forth a New term LMV’s (Local Merchant Vendor). The LMV has very little time or money to build a …..better tool kit. The simple fact or tennant is to get the LMV’s phone to ring. Now the entity that can accomplish this feat and do it for FREE will have built the better tool kit. Google Maps on Android-running mobile phones are really cool.. Fast but sometimes not that so accurate.